Posted on 12. June 2018. 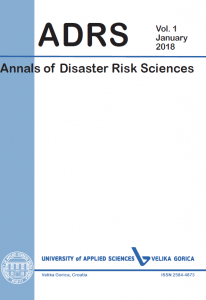 The journal published by the University of Applied Sciences Velika Gorica “The Annals of Disaster Risk Sciences (ADRS)” entered the database of Croatian scientific journals HRČAK. Hrčak is a central portal that brings together Croatian scientific and professional journals that offer open access to their papers in one place. Users can easily find journals and papers by browsing (by alphabet or by scientific field) or by searching through various fields. Open access to scientific literature means free availability on the public internet, permitting any users to read, download, copy, distribute, print, search, or link to the full texts of these articles, crawl them for indexing, pass them as data to software, or use them for any other lawful purpose, without financial, legal, or technical barriers other than those inseparable from gaining access to the internet itself. The only constraint on reproduction and distribution, and the only role for copyright in this domain, should be to give authors control over the integrity of their work and the right to be properly acknowledged and cited. It should also be emphasized that “open access” refers only to scientific literature that authors publish or make available to publishers and readers without any financial compensation. These are primarily reviewed papers from scientific journals, papers in conference proceedings, but also all the unreviewed preprints that scientists want to make available online.